Eggs came first. So that question is settled once and for all. When my brain is in chatty-magazine-reading mode I don’t really want to have my Latin tested. A good quality proprietary mash or pellets fed ad lib will provide all the protein your birds need. Ad lib? What’s that doing there? It’s even italicised in the original, just to make double sure you trip over it and spill your cocoa. The common understanding of ‘ad lib’ is to do something off the cuff or without rehearsal (as in the common expressions ‘he’s ad libbing’ or ‘she ad libbed’). Grow Your Own magazine is not growing on me at all as I am now irritated into consulting my dictionary. I find that ‘ad lib’ (from the Latin ad libitum) can also be used to mean ‘as much and as often as desired’. I can sort of guess that from the context in the Grow Your Own piece, but that’s not the point. Why not just write ‘fed liberally’ or similar? So, to add insult to injury, ‘fed ad lib’ is anyway redundant. Foreign words and phrases have their place. That place is not in a chatty mag where they are de trop. See what I mean? Annoying, isn’t it. In the eighties the Guardian would be liberally sprinkled with words, and even phrases, in French, for no better reason than that they could, which is the case here, I suspect. Hi, Ron — that’s exactly right: ‘for no better reason than that they could’. As ever, Orwell hit the nail on the head: Never use a foreign phrase, a scientific word or a jargon word if you can think of an everyday English equivalent. He also said something about not using clichés (example: ‘hit the nail on the head’), but I’ll gloss over that. Even though it was number one on his list of six writing rules. Someone – Stephen King or James Thurber, pretty sure it was one or the other, writing about – er – writing, said one should never use a $10 word when several 50-cent words would get the job done (I might have paraphrased very slightly). Something I always try to abide by. I’m leaning towards Thurber, as my memory of it, I’m sure, goes back way before King. And I’m pretty sure I’ve already said that on one of your posts, come to think of it . . .
No — I don’t think you’ve said that before, Ron. I’m sure Orwell would agree with the sentiment. Ha! Turns out Orwell felt the same way with his rule 2 “Never use a long word where a short one will do”. Proprietary mash or pellets will provide all the protein your birds need. 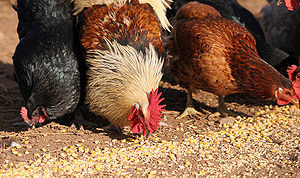 A good mash or pellets given to your chickens liberally will provide all the protein the birds need. Don’t worry about overfeeding; the chickens will only eat what they need. Hi, Lisa — I wish you were working at Grow Your Own magazine — it would have saved me a lot of irritation. And kept my blood pressure at a safe level. You’re so right about people wishing to appear smart. Thanks, as ever, for taking the time to comment here. Moving from a focus on the language to chickens themselves, here’s what we’ve learned from caring for a small flock: They’ll eat pretty much any damn thing that ends up in front of them! Why try to pretty it up? Just ask the proprietary of your local feed store what he or she recommends. Hmm… I’ve always wondered about free-range organic chickens. As chickens will eat – apart from provided feed – pretty much anything small enough that crawls, or flutters across their path, how many random bugs, that could come from anywhere, especially if they fly in, does it take before they stop being organic? Or is that conveniently ignored? Hi, Ron — yes, I agree. I am very suspicious of all claims that are made about so-called ‘organic’ food items. I once – camped, one evening, on a backpacking trip around the Peak District – spent a half-hour hand-feeding a huge, flamboyant, cockerel bits of pork pie and mushy peas. Don’t think that was very organic. Together Gable and Moricone achieved a thrilling theatrical experience, taut and passionate, with a compellingly raw verismo. Verismo. That would be ‘realism’, I expect. I guess if you can have magical realism, you also can have compellingly raw realism. Now please excuse me, because I’m compellingly hungry. … or magically compelling raw realism. Or compellingly raw magical realism. Or raw realism at its most magically compelling. I shoulda been an art critic.